I’m presenting my M1 thesis work today! Here is my final poster and the current cover to my report. Yesterday I finished my research proposal that I am using for grant applications. It is probably the most difficult single page I’ve every had to write! How does one summarize such an expanse of ideas? Well I think I finally managed it after one month of writing and rewriting. So here goes. Feel free to give feedback! Architects are essentially problem solvers of spatial situations. A successful building or urban setting responds efficiently and dynamically to the needs of the surrounding site or city. But before designing a response, an architect must first identify and understand the past and present conditions of the site, the questions. The challenge of the future will be to continue to understand our urban environments as they increase in complexity. As if urban conditions in North America were not complex enough, there are areas, particularly in lesser-developed countries, that are subject to not only the complexities of rapid informal urban growth and very little data or documentation, but also additional layers of local conflict that stem from multiple, interrelated sources. The North Kivu province of the Democratic Republic of the Congo (DRC) has probably one of the most complex situations in the world and has left the region in a continued state of instability. Researchers of the situation argue that peacekeeping efforts have failed due to a centralized strategy of conflict resolution instead of, in addition to those actions, applying local resolution initiatives and making an in-depth attempt at understanding what is happening in the cities and the surrounding region (Autesserre 2010). The research proposes to launch a bottom-up data gathering and mapping initiative by creating a platform for data collection from the local population. The interactive interface will allow users to visualize their environment to promote transparency, dialogue, and educated decision making and strategic planning. 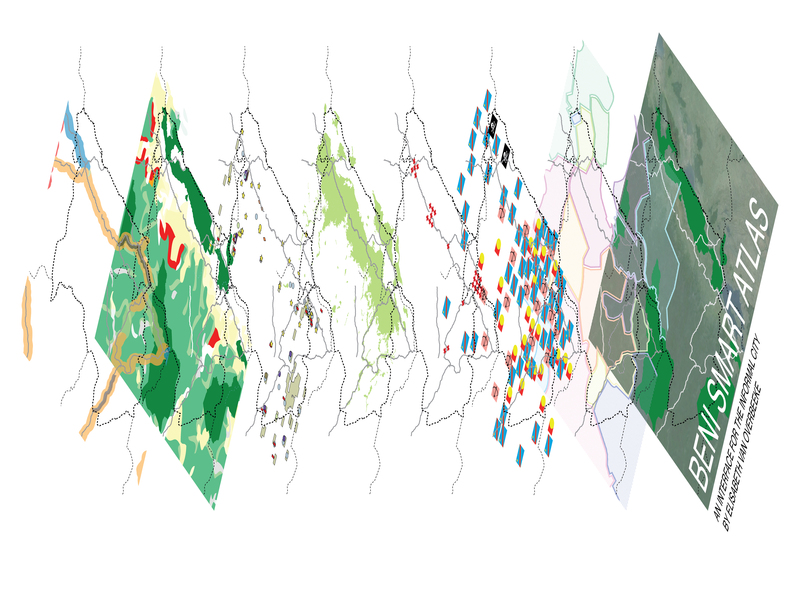 The research will harness the potentials of data collection, mapping visualization, and social networking capabilities to create a virtual space or interface that can serve to understand and therefore become a social innovation tool for the city of Beni and the surrounding region of North Kivu in the Eastern DRC. Architect and theorist James Corner argues that the role of the architect is shifting and that architects today have a responsibility to decipher increasingly complex environments through analytical mapping (Corner 1999). Mapping is now able to represent complex layers of physical data, run games and simulations, and serve as a platform for social dialogue. My research builds on recent research in theory and computation and extends it by anchoring to the informal context of Beni and environs. The map will be a consistent tool for input and feedback, allowing the interface to maintain a strong connection between the physical and virtual environments. The research will involve first building a framework that collects all of the global, top-down information and determines what local data is needed and what methods should be proposed for local information gathering. I will then develop the digital interface and physical curriculum that will benefit the population with no internet access. Once developed I plan to travel to the DRC where I will partner with the Université Chrétienne Bilingue du Congo (UCBC) to launch the program by providing students and the community with the digital tool and by teaching and holding community charettes. Through this research the university will gain a collection of maps about the city of Beni that they can make available to the community and use as a resource for future initiatives.